You can only have side hatches on submarines and space stations. Hatch is a funny word. Hatch hatch hatch. 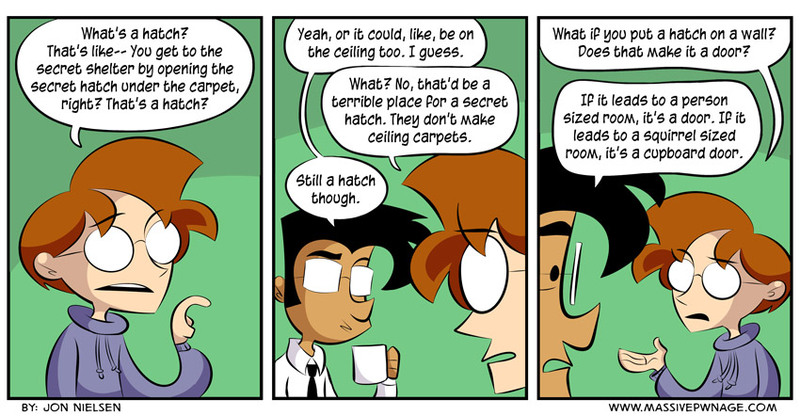 This entry was posted on Friday, October 4th, 2013 at 12:00 am and is filed under Comics. You can follow any responses to this entry through the RSS 2.0 feed. Both comments and pings are currently closed. If it looks and leads outside, its a window. A side hatch that leads to a small room that gets really hot is an oven door. a side hatch that leads to a small, metal cylinder with holes in it is either a washer or dryer door.